Nike Little Posite One "All-Star"
DURABLY BUILT, HERITAGE HOOPS STYLE. The Nike Little Posite One (GS) Boys' Shoe offers total comfort and support, with a durably molded upper, resilient foam midsole and rubber outsole for traction. Molded foam upper is lightweight and durable. Foam midsole provides lightweight, resilient cushioning. Pull tabs at the heel and tongue for easy on and off. 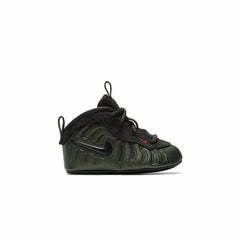 The original mold for the Foamposite One was hand-sculpted by a Nike designer in the mid-1990s. That same form has since been used in many of the most popular basketball-inspired styles of all time.